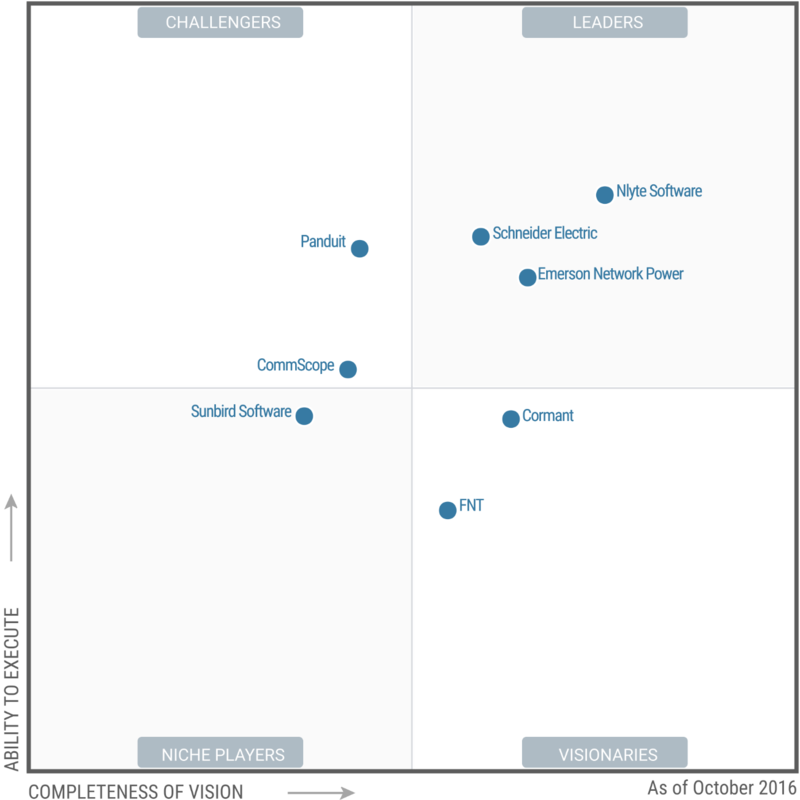 Nlyte Software, Emerson Network Power, and Schneider Electric continue to lead in the DCIM software market, according to a new analyst report. Nlyte is ahead of its two primary rivals, both much bigger than Nlyte. Nlyte is leading among the top DCIM software vendors in terms of both vision and ability to execute, Gartner said in its 2016 Magic Quadrant for DCIM, released earlier this month. DCIM stands for Data Center Infrastructure Management. The DCIM market is continuing to evolve, according to the analyst firm, although large enterprises continue to be the primary adopters of DCIM software solutions. And adoption in the US is happening faster than in other parts of the world. Gartner has observed vendors taking bold steps to gain market share, including acquisitions to fill functionality gaps and efforts to improve the implementation experience and ease of use, which are two of the biggest deterrents to DCIM software adoption. While DCIM is not industry vertical-specific, the analysts did note two verticals that have emerged as primary targets for the vendors: federal government and colocation providers. Colo companies are deploying these tools to optimize their facilities and, in some cases, to provide DCIM as a service to their customers. Adoption of DCIM software by government agencies is being driven by the government’s data center consolidation and optimization initiatives. The latest White House effort, called Data Center Optimization Initiative, among other things requires agencies to implement DCIM tools by the end of fiscal 2018. Not all vendors that were on Gartner’s Magic Quadrant for DCIM last year made it to the latest quadrant. The analysts dropped ABB, Device42, Geist, Modius, Optimum Path, and Rackwise because they “did not fully meet all of the 2016 inclusion criteria.” FieldView Solutions was dropped because it has been acquired by Nlyte. Among other criteria, DCIM software vendors have to meet Gartner’s definition of a DCIM tool, have customers in North America and at least one other region, have generated at least $5 million in 2015 DCIM revenue, and have deployed with at least 75 customers or have at least 75,000 racks under management by their DCIM solution.